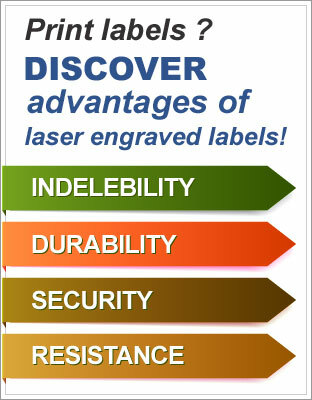 LASERTECH laser labels are top quality solution for permanet labelling your product. Laser engraved labels are suitable for endless marking applications that require durability, flexibility and resistance to forgery. Other advantages are thermal and chemical resistance as well as the high level of abrasion safety. The label are available with continuing number, barcode, datamatrix code, and is also possible to insert lists of variables. LASERTECH use only high quality raw material like TESA 6930, 6931, 6940 and 3M Scotchmark 7846, 7847, 7848. LASERTECH laser labels are made with a specialty film stockthat can be inscribed by a laser beam., witch is designed to ablate the top layer to create an inverse image. Since the laser is also able to cut the entire label , it provide hign flexibility for producing just in time various formats. Two-layer construction and engraved provide long-term barcode readability. The LASERTECH laser label can not be removed due to the characteristics of the high performance acrylic adhesive. After the application of the label to the surface, its adhesive power is superior to the internal strength of the foil. the label provide destructibility to meet security labelling requirements. Our labels are extensively used in different sectors as a solution to a wide variety of problems. The specifications contained herein provides invaluable information for our clients. However, as experience has shown, requirements can vary, even within the same application. We therefore recommend that our client carry out specific tests to ensure the viability to our labels in their processes. Our personnel will help with any enquiries you may have.